As the nation pauses to remember the 15th anniversary of the Sept. 11th attacks, firefighters across the Bay Area are taking time to honor their fallen comrades during memorial ceremonies. Fresh wreaths were purchased and sound equipment was checked Saturday in anticipation of Sunday morning's memorial tribute at Station No. 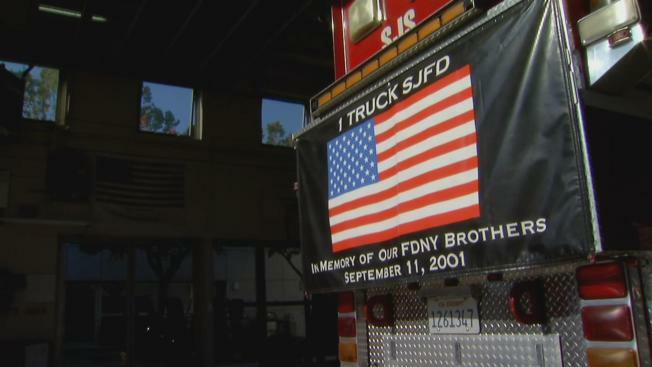 1 in San Jose, just one stop on a downtown-wide procession that will honor those lost in New York, Washington D.C. and Pennsylvania 15 years ago. Firefighters at Station No. 1 have not forgotten that devastating day. "It seems like it was yesterday for us," Battalion Chief Reggie Williams said. "On that day we lost 343 of our brothers." Thanks to daily reminders plastered around the station, including a flag hanging in the halls with the names of firefighters who died while risking their lives on 9/11 in addition to other photographers displayed throughout the building paying tribute to the men and women of the New York Fire Department, firefighters in San Jose are honored to pay homage whenever they have the chance. Joining other fire departments from around the country taking time to remember the lives lost, the San Francisco Fire Department rang a bell and read the names of the 343 fallen firefighters at "First Responder Plaza" during a remembrance ceremony early Sunday. San Francisco firefighters ring bell to honor those lost 15 years ago. Betty Ong, a flight attendant from San Francisco who was killed on Sept. 11 when the plane she was on flew into the North Tower, was also remembered during that ceremony and a remnant from the World Trade Center, which will be installed in the city at a later date, was unveiled. "We have another physical piece that will represent not only the tragedy, but the heroism," Mayor Ed Lee said. Fire departments across the country typically take a moment on the morning of Sept. 11 to pay their respects to the emergency responders who jumped into action to help those trapped or in danger. "All stations throughout the city are currently holding this ceremony," San Francisco Fire Department Chief Joanne Hayes-White said. "It's our way of always keeping the courage and selflessness in our minds." 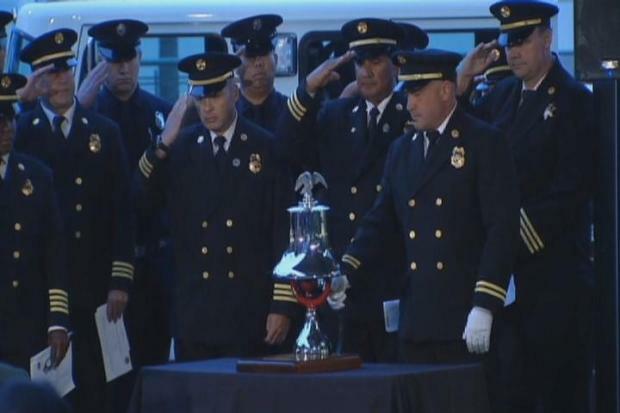 Amid the sadness, San Jose Battalion Chief Williams says that firefighters have learned important lessons in training and heroics from those who sacrificed before them. Williams and other fire personnel will be on hand for Sunday's San Jose ceremony which gets underway from the Cathedral Basilica of St. Joseph at 11:30 a.m. before reaching Station No. 1 around 12:45 p.m.